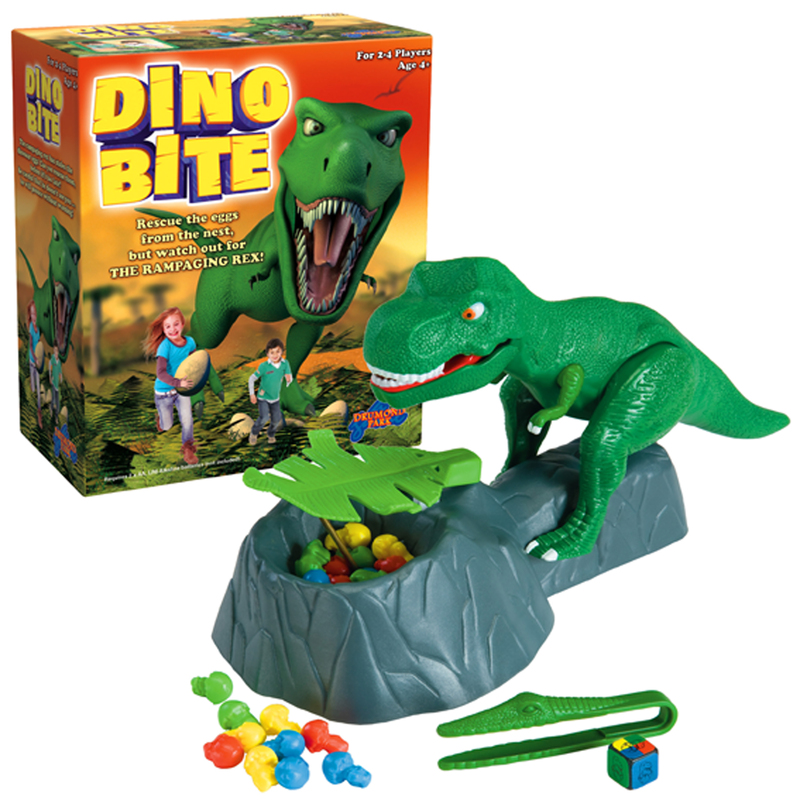 Dino Bite is an exciting game from Drumond Park aimed at ages 4+. This is perfect for my just turned 5 year old. He has been studying dinosaurs in school this year and loves the chance to have some one to one time with Mum playing games. As soon as he saw box he was really keen to play it and he straight away said that he liked the look of it. The game includes a T-Rex which attaches to the Dino nest base, where there is a leaf attached, and 20 baby dinosaur eggs hiding underneath. The aim of the game is to sneak out the most eggs without the T-Rex noticing. 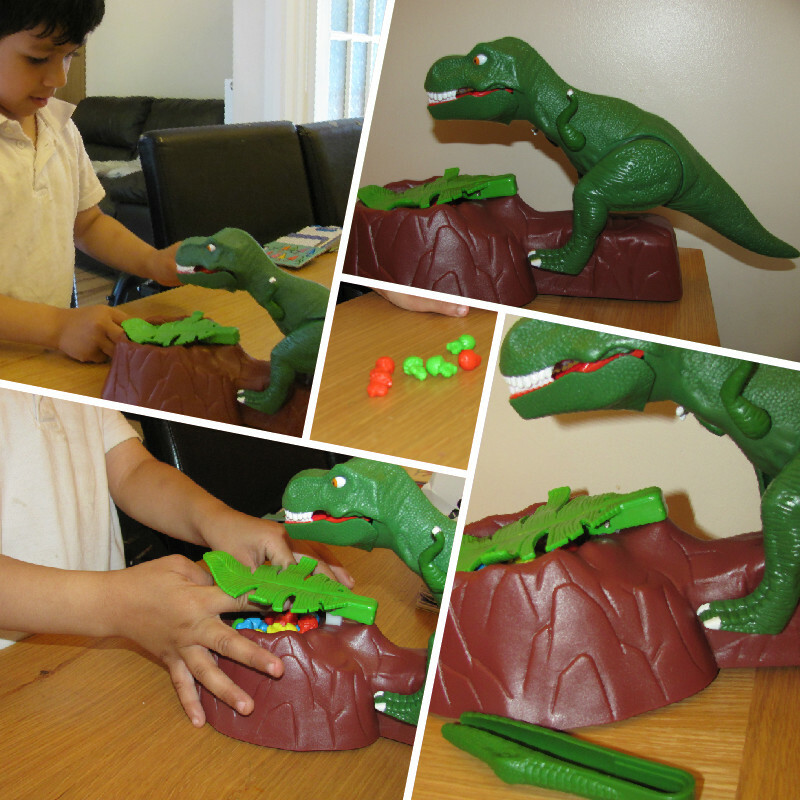 The Dino babies come in 4 colours and there is a dice to roll to see which colour egg you need to take out. There is a pair of tweezers included but the rules mention that younger children may find it easier to use their fingers – which Mr Z chose to do. I did use the tweezers (obviously as a grown up I can not get away with going with the easy option!) and I can see how they are slightly tricky for some young children. If they can manage to use it, it will be good for strengthening the muscles in their fingers which helps develop the fine motor controls for pencil grip, which can improve the neatness of handwriting. So once Mr Z has had a bit more practise at the game, I will start hinting for him to have another go with the tweezers! We have a bright green knitted t-rex which is both mine and my son’s favourite! My son likes big Al the allosaurus from the walking with dinosaurs show. Diplodicus. Because we like saying the name. My 5 year old son is crazy about dinosaurs! His favourite changes a lot, but at the moment he is keen on his Parasaurolophus! both my boys would say T-rex! My daughter loves her toy stegosaurus. A diplodicus from Meg and Mog (egg story) because it is the kindest dino from the three. My kids and myself all love the Stegosaurus! The king of dino’s – the T-Rex! Triceritops – no others matter for him! I’ve always liked Pterodactyl, flying dinosaurs. Barney, we know all the words to every song! I’m a Pterodactyl fan – it’s the spelling, it’s brilliant, so are the flying dinosaurs, by the way!! My oldest loves the T-Rex and my youngest boy loves Triceratops. My daughter doesnt like dinosaurs, they scare her, lol. My little one loves the Diplodocus and their long necks! mine is triceratops! The kids would say T Rex though. We have a 2 headed one! Their names are brother and sister! my son is a fan of any t rex! The dinosaur out of peppa pig. I would say the velocoraptors from Jurassic park, my 7 year old however would say Rex fromtoy story. Gotta be Rex from Toy Story! !